Summary: From the outside, Mill River looks like any sleepy little Vermont town where everyone knows everyone and people never need to lock their doors. There are newcomers for whom this appeals, from police officer Kyle Hansen and his daughter Rowen, who are starting over after heartache, to Claudia Simon, the schoolteacher who is determined to reinvent herself. THE MILL RIVER RECLUSE by Darcie Chan has quite a fascinating back story. It was initially released as an e-book in the Kindle store and became an instant bestseller. Within three months, it was a New York Times bestseller and sales just continued to grow! Ballantine/Random House has released the book in paperback and at the end of the month will be publishing the sequel THE MILL RIVER REDEMPTION. Talk about a dream come true for a self-published author. THE MILL RIVER RECLUSE is a very special novel. It's one of those books that just warms your heart and makes you feel good about people. I really enjoyed it and definitely see the appeal. It's not wonder that this novel caught on with readers and became so popular. The title of the book refers to Mary Hayes McAllister, an elderly woman whose life has been tough to say the least. As a teenager, a horrible event drastically changed her life and she found herself most comfortable around her father and horses. One day, Patrick McAllister, a handsome and wealthy man, showed interest in Mary; and she found herself pushing her limits by socializing with him and his family. Mary thought Patrick was the perfect man, but soon after the wedding, she discovered that he had a dark side. As Mary tried to navigate her troubled marriage and fit into her new world, another tragedy strikes her life; and basically, Mary decides to be a recluse in her Mill River home... for almost 60 years. She always wanted to be part of the community but never felt comfortable, so instead she watched the townsfolk and contributed in her own special (and generous) way. The one person she managed to see regular was the town's priest Father O'Brien who had a few secrets of his own. While none of the townspeople ever got to know Mary, she did manage to touch their lives long after her death. I enjoyed so many things about THE MILL RIVER RECLUSE. First and foremost was Ms. Chan's writing style. This book was so easy to read and I didn't ever want to put it down. I became extremely interested in all of the characters' lives, and I cared about each and every one of them (or at least the nice ones!) In addition, I appreciated the way she told this story. It began with the death of Mary and then went back and forth between the present and the past to give her back story. The novel also provided multiple characters' perspectives which allowed me to better understand them. Ms. Chan did an excellent job of telling the story using these different methods, and it just came together and worked really well. I also loved how well she brought the small Vermont town of Mill River to life. Not only were the descriptions of the town vivid, but the way she described the people who lived there and how they interacted with each other made the town so real. I am so happy that her next novel also takes place in this special place. Finally, I enjoyed how this book made me feel. There was some ugliness to this story (especially in Mary's past), but overall this book was sweet. I found the characters to be well developed and complex (especially as it pertained to the secrets in their lives), and my heart went out to (almost) all of them. I also really liked how many of the characters in this novel reinvented themselves and got second chances with life and love. So many of the messages in this story were uplifting! 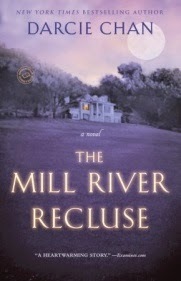 I think THE MILL RIVER RECLUSE would make an excellent book club pick. There is a reading guide with fourteen thought-provoking questions. Some of the themes you might want to explore include abuse, mental illness, parent/child relationships, grief, loss, second chances, community, friendships, and secrets. Because this novel had so many interesting characters, there is a great deal to discuss about each and every one of them. THE MILL RIVER RECLUSE is a great read! Highly recommended! Mill River reminds me of Mitford which I find very comforting. This sounds so good to me! Wow. What a publishing story! It does sound like Mitford. And it's nice to have a Vermont setting. Ohh sounds good! Thanks for sharing.